Homemade yogurt made from raw milk from local pastured cows! Do you dream of getting your hands on some raw, local, organically produced milk from grass-fed, pastured cows at a reasonable price? Do you love the idea of making your own simple, old-fashioned cultured milk products? Where there’s a will, there’s probably a way. I am getting three gallons of good raw milk every other week from a farm in the area. I make four quarts of delicious and nutritious yogurt for about $7 every other week. It’s extremely simple and satisfying. It’s an easy way to be more self-reliant and less dependent on industrial food corporations. It’s also a great way to give your kids a closer relationship to food and its magic. The sources for good raw milk tend to be more underground than otherwise, but such sources do exist. They’re likeliest found by word-of-mouth or word-of-internet. For a list of possible sources along with good information on why raw milk is better, go to www.realmilk.com. Dairies are forbidden to deliver raw milk in Texas, so you fellow Texans can choose to be a renegade like me and my sources or you can pick it up at the dairy. The World Hunger Relief Farm in Waco, TX, sells raw organic goat milk. They sell it in frozen half gallons. I’ve stopped there when I’ve passed through and brought some home a couple of times. It makes good yogurt, too, and the purchase supports a great cause. I’ve been warned of the risk I’m taking with unpasteurized milk. I’ve also been cautioned of the dangers of using manure in my garden. The methods humans used for millennia have become foreign to us. There is good bacteria and there’s bad, but many have grown afraid of small farms and any bacteria that might be alive in raw milk. We seem to trust the modern, industrial, antiseptic and regulated more than the seemingly unenlightened natural and traditional. 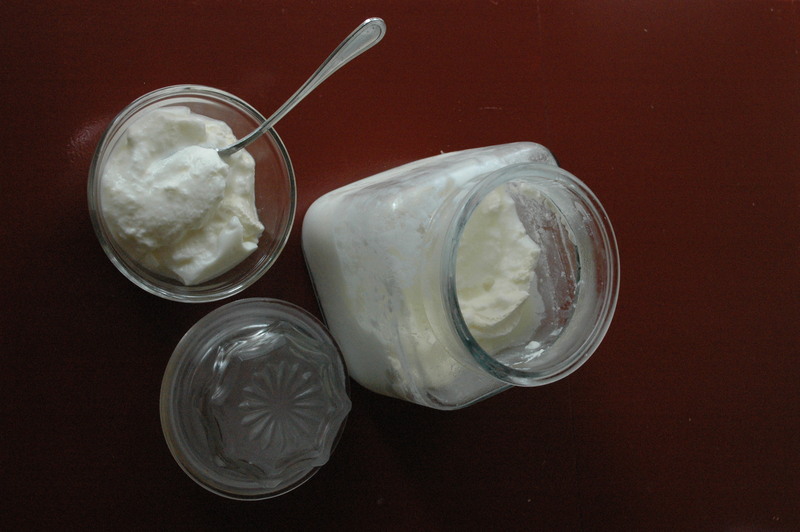 Like a yogurt culture that is passed on and keeps reproducing, the yogurt recipe I share with you came several years ago from Peggy Sechrist, a sustainability and real foods activist. She’s the owner of the first certified organic grass-fed beef ranch in Texas. She wrote down the recipe for me from the Weston Price Foundation website. – ½ C starter yogurt: I use Greek Gods plain, whole milk yogurt, works well. A quality starter yogurt makes better yogurt. Slowly and gently bring the milk to 180°. I do this by rigging up a double boiler, placing one pan inside a larger one with some hot water in it. It takes a good while to heat it up, around 60 to 90 minutes, depending on the strength of your fire and the amounts of water and milk you’re heating. 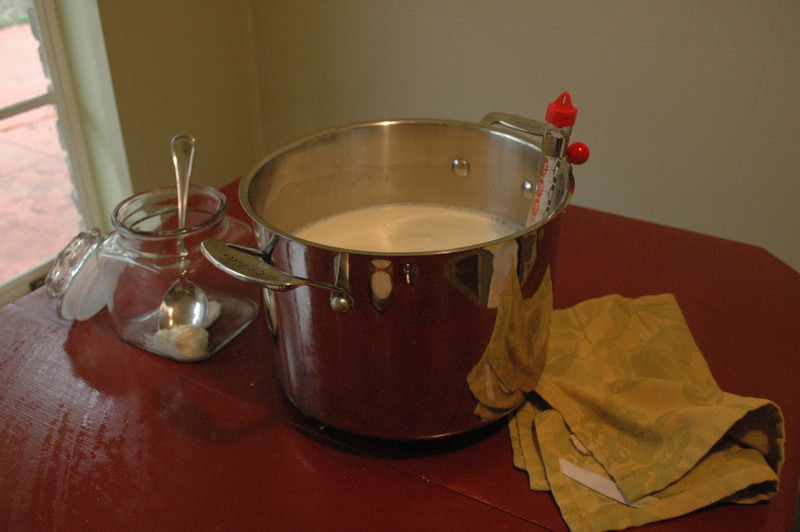 Then remove the pan of milk from the stove and let it cool to 110° (takes about another 90 minutes). Meanwhile, divide starter yogurt among the jars. When milk is cooled, pour in about ¼ C milk in each jar and whisk in with the starter yogurt. Fill jars with the rest of the milk and put on the lids. Set the jars on a heating pad set on medium heat and wrap it up around the jars as is possible. Then cover it all with a heavy blanket or towels. Leave it alone for a good 8 hours. Unwrap the jars and place them in the refrigerator. The yogurt keeps well in the fridge. Delicious with a little honey or jam. French Kids Don't Get Fat, But Do French Kids Cook?